It is very important to know and trust that your doctor has you and your needs at heart when treating you. The doctor is always open to questions and suggestions. 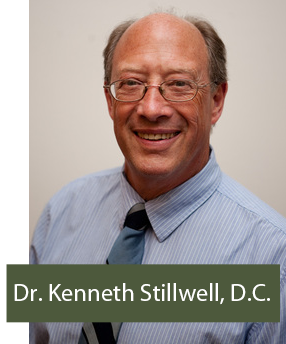 Dr. Kenneth Stillwell started practicing with his father, Dr. Robert Stillwell, in 1978 after graduating from Palmer Chiropractic College in 1977. The next five years were a time of great transition. Dr. Ken married Lorraine and it was within the next five years that their two daughters were born. He learned a great deal working at his father’s side. He did volunteer work as one of the team doctors for the Pierce County Bengals for two and a half years alongside of some other very fine chiropractors, who were also volunteering their time. That team became the winningest semi pro team in the northwest. Currently he volunteers at a local high school for the football, basketball, wrestling, and swimming teams. It was at this time that he started taking motion palpation courses from Dr. Faye. After many years of instruction and becoming a seminar helper Dr. Ken was asked to join the teaching faculty for the Motion Palpation Institute. He taught weekend courses for the Institute for the next seven years. He was sent across the United States including Hawaii and Alaska to teach examination and adjusting of both the spine and the extremities. He also taught frequently in Canada. Due to his teaching and practical experience he was invited to go to southeast Russia (Vladivostok) and help teach the medical practitioners what chiropractors do so that they would work with the chiropractors and help start a clinic there. Most recently, 2008, Dr. Ken was invited to teach courses for doctors and students at the Chiropractic College in Sweden. He has also taught courses many times for local chiropractic organizations and for state organizations. He has also been a speaker and instructor at state conventions. In 1983 he started doing second opinion examinations for Labor & Industries, insurance companies, and attorneys. He still does these today and is certified to do second opinion exams and impairment ratings for Labor & Industries. Dr. Ken was a board member for the Washington Chiropractic Association which eventually merged with the other state Chiropractic Associations to form the Washington State Chiropractic Association. He was a board member for that initial year, acting as the head of the continuing education committee. He continues to maintain an active membership to this day. Dr. Ken has had special training and/or been certified in many of the different chiropractic disciplines. He has been certified in Motion Palpation of the spine and the extremities and has been an instructor in teaching both. He has also been trained in treating pregnant women and babies, and been certified in the Webster techinque. He is certified in Graston technique and the Cox technique. He has taken special courses in Leander technique, recoil, neuromuscular re-education, and rehabilitation. He has also taken special courses relating to injuries as related to accidents and auto collisions. Dr. Ken maintains a full time practice. Some of his hobbies include building and working with wood, camping and hiking, and horseback riding. Dr. Ken is available for speaking engagements.